When The Floating Book was launched in the United States, Michelle Lovric was asked to explain how she came to write about Venice. 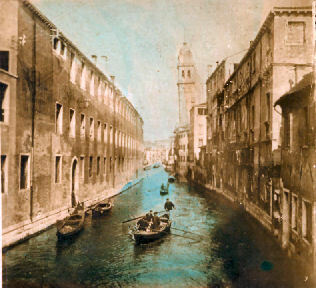 I first saw Venice when I was eighteen years old. Standing on the deck of a vaporetto steaming up the Grand Canal, I felt something click into place. I remember physically nodding just once in a decisive manner, an acknowledgment to the contract that I made in that moment. I already knew that I wanted to be a writer, and had begun training as a journalist. But now I had agreed to be a writer about Venice. It took me a while to get there, and success in a non-fiction career to cushion the risk. But the first moment I could, when my anthology Love Letters became a New York Times best-seller, I took time out, rented a flat in Venice, and dared to start writing about her. Now I have fulfilled my side of the deal several times over – by writing novels and editing an anthology; by learning Italian and a little Venetian; by translating some Venetian poetry and prose into English for the first time; by making my home there for as much of the year as I can. Yet even now I continue to feel the demands of that contract. I still feel happier in Venice when I am working, writing about her. I rise early to start paying my dues. I’m usually at my ‘desk’ in my local bar by 6am, annotating typescripts over coffee, to which I’m inclined to attribute an alchemical role. By day I walk around the city as one or other of my characters, seeing it through their eyes, feeling the stones through the soles of their feet. I wander late at night, enacting murder scenes on bridges. I besiege Venetian friends with questions, questions, questions. I collect bizarre Venetian proverbs the way other women search out beautifully crafted shoes. Like eskimos coining a whole vocabulary of snow, I seek new ways to describe the effect of water on marble. Half of these notes never see the printed page: when ‘loose’ in Venice, I lack that organ of discrimination a novelist needs to keep a story in focus. Often I must return to London, to look at the blank wall behind my desk and the screen, in order to beat myself into some semblance of order and produce a readable book, rather than an effluvium of effusions. Then, when the manuscript has heaped up in piles, I take it back to Venice and walk it around the city, rereading each scene in the exact location where it takes place, refreshing each description with the sounds and smells that could not reach my imagination when it crouched over the faceless grey computer in London. In both cities, I live a waterbound life. I always have. I was born by the ocean in Sydney, lived many years by the sea in Devon. These days my London home is a Georgian wharf on the Thames that looks over railway bridges and skyscrapers to Saint Paul’s. I prefer not to compare this dramatic but industrial view to the grace and fantasy of the Grand Canal: the feeling is too painful, for when I am not in Venice I resent, with a childish bitterness, the fact that Venetian life continues without me, that the cappuccini are still served at the Bar da Gino without me, that sun still sets over Zattere without me, that the squid still writhe in their metal trays at Rialto without me to pity them. Sometimes I think that Venice is the font of all stories. Whatever item of research captures my imagination, I am inevitably led back to her, even when I do not plan on it. When I decided to write the life-story of Catullus’s poems, from their composition to their first publication, I assumed that the novel would be set in Verona, because that is where the original manuscript was found. However, magically, it turned out that the first edition was printed in Venice, by a German who married a Venetian woman, and soon I was there again, holding in my hand a manuscript of Catullus (so valuable that it has its own little diary of everyone who touches it) in a room painted with the names of the noblemen who came to inhabit The Floating Book as its chorus of characters. Next I investigated charlatan doctors of the eighteenth century for The Remedy. At the beginning of my research I did not know where it would lead me. Back to Venice, of course, the crossroads and crucible for all quack medicines, as it turned out. London quacks even pretended to be Venetian to gain the confidence of their victims. And what was their favourite ingredient? Venetian treacle, made from vipers. And so it goes on. I am no longer surprised, but only gloat about these discoveries. Since researching The Floating Book, I have come to feel it is inevitable that my books will be set in Venice, perfumed by the city, no matter what or whom they are about. Once a writer-friend came to Venice to stay with me, and we wrote in industrious, companionable silence in the same room overlooking the Grand Canal for two weeks. I drafted chapters of The Floating Book and she worked on her own novel. We did not discuss or read each other’s work. But back in London she did show me what she had written. I was astonished, not to say vaguely offended, to see that Venice featured not at all, except in the form of a postcard propped up on her heroine’s mantelpiece. It was brilliant, subtle. I could never be so abstemious.